Because I have both full-frame and APS-C digital cameras, I suggest that for most photographers, APS-C is more than satisfactory. Your argument does make sense for photographers who want to print very large images, say 75 cm x 100 cm; for most users, current APS-C cameras are perfectly fine. That's why few manufacturers offer full-frame, 24 mm x 36 mm, digital cameras; it's not worth the extra expense for most buyers. I don't think there is any Pentax FF camera coming in 2012. Most reliable posters on DPR have mentioned K3 (update from K-5) is going to be APSC camera with the 24 MP sensor. Expect 2013 at the earliest, but most likely 2014 for FF Pentax. (1) First Pentax need to develop some FF lenses (at least 24-70mm F2.8, or 24-105mm slower kit lens). Some FF frame primes, like 85mm 1.4, and something like 70-200mm F2.8 ... A full camera without these lenses would be pretty useless. (2) There are technical issues involved with making IBIS compatible with a much larger full-frame sensor. Unless Pentax engineers were already working on these two issues under Hoya, there is no way Ricoh would resolve this and release a full frame camera within one year, which would be 2012. @Razii, I said before 2014, where do you read 2012? Moreover, I know about FF lenses and FF image stabilization (e.g., Hoya filed patents for both). But of course, we can only speculate as the current rumor mill is APS-C only. > A full camera without these lenses would be pretty useless. poor leica... so useless if you just have it w/ 35 or 50mm. I use both a D7000 with Sigma 17-70 OS (DX) and a D800 with 24-120 F4 VR (FF) and I actually like the D7000 combo more. It's smaller, quicker, and the Sigma focuses much closer so I have more image options. The D800 is a fantastic camera but it is also much bigger, heavier, and reminds me of shooting wuth a medium format camera which is no small feat. I believe there is a place for both. They are very different from each other. I agree with you. Camera manufacturers are industrialist, economist, opportunist. There are 100 times more potential consumers than prosumers. The same reason why Toyota is the top car manufacturer, not a Bugatti. Any industrialist, economist & opportunist would always think this way, who really care about the tiny niche prosumer market, just give them an impression that "we care", but focus more on making more bucks from the consumers. @Daniel, are you sure? AFAIK, Volkswagen is now #1 (in turnover) and this includes Audi and Porsche. It may be true that the (lower end) consumers are an important part of a corporation's backbone. But when it comes to growth and competition, I think that the (higher end) consumers (aka prosumers) are THE decisive element. E.g., Audi becoming cult in China has driven much of VW's recent success. I can get pentax k-5 for 900 now. but d800 is triple the cost. I only have the budget for k-5..so I went for k-5..
not to mention full frame lens is usually more expensive than aps-c only lens..so toally cost is a lot lot more. well, if a person make living as photographer, then money should not be a issue. then I see no reason not getting a d800. Agree here. There 's a lot of idealistic vacuum reasoning in this post. The cost is a major issue and it's not artificial. I work for a company that builds chips in the cm range and we charge a lot of money for them because you simply cannot get that many from a single wafer. And there's always the chance you'll have something go wrong with any chip. With bigger areas the more likely you'll have something go wrong during manufacturing. As a result you get many more discards. All these reasons pushes prices up. 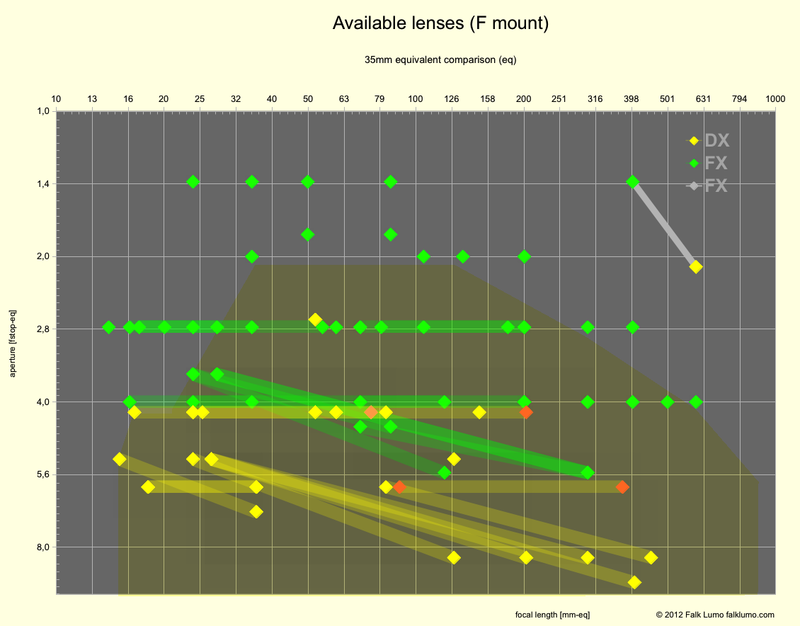 The cost issue extends to the higher requirement for full frame lenses. There's no point in buying a full frame body and pairing it with subpar optics. Good lenses are getting bigger. Just look at the new corp of 24-70 lenses. They grew. And bigger lenses use more of those expensive optical glass. Your argument regarding the quality you get from a full frame seems a bit contrived as well. I have printed many times at 20x30 size with APC-C images and I have also used images from full frame. Franky, unless I have my nose pretty close to the photo it's hard to tell the difference. Sure, a fullframe body is quite a bit more expensive (for now). However, regarding glass I find it to be quite the opposite. I switched from a Pentax K5 to a Nikon D800 and I can say I'm now spending less on lenses than I used to (or would) with Pentax. You have to compare what is comparable: a f/4 fullframe lens is equivalent (in terms of DOF) to a f/2.8 lens in APS-C. My kit lens on my D800 is a $120 28-105 f/3.5-4.5 that weighs 450g. If I were to get a similar lens for APS-C, it would have to be 18.5-70 f/2.3-3. Already, such lens doesn't exist and if it did, it would be much more expensive, bigger and heavier than the FF lens. The APS-C equivalent of a $200 Nikkor 50mm f/1.8 G (185g) would be a 33mm f/1.2. How much more expensive, bigger and heavier would such a lens be? A 24-120 f/4 FF lens is equivalent to a 16-80 f/2.8 lens in APS-C world. Of course, such a lens doesn't exist. I just bought a used Nikkor 20mm f/2.8 for 230 euros. The optics are great and it's super small and light (270g). How a 13mm f/1.8 for APS-C would compare? The bottom line is this: you can always close down the aperture if needed, but you can never make a lens brighter than it is. Finally, with a Nikon D800 and its 36MP you can now crop 1.5x your photos and get the same magnification and quality as with a D7000 which is really convenient. Please, don't post as anonymous, leave a nickname at least. And please, don't post before reading the white paper I am refering to in the article. E.g., the post and reply above make no sense for someone having read the white paper. Or after having understood camera equivalence. Regarding cost: I estimated cost for 24x36mm CMOS sensors using conservative silicon cost models, including estimating yield rates and waste ratio. I considered reticle mask stitching too. So please again, no simple counter-arguing w/o actually reading my work. Thanks. There is a rumor that Nikon will stop buying Sony chips, and as Sony seems to be taking more chances breaking new ground for some time, (I still have my DSC R-1 and it still works great with that stationary lens)I believe that Sony will be the one to come out with a $1500 full frame and some new lenses too. It would sure be a kick in the teeth to Nikon and Canon, and move Sony inovation another notch ahead. Rodrian, are you referring to the rumor that the D600 is using Aptina, or something else? I agree about Sony being an innovator. But I tried to confine my post to SLRs and Sony doesn't make them anymore. Just because it has an EVF and different tech you don't consider it in your analysis? I think that's a bit shortsighted (since they still take pictures in the end, and look the same as DSLR's). Yes, that D600 is rumored to be using Aptina, and I don't doubt Sony using a full-frame sensor in a hybrid camera, to fill Nikon's void(in sales), possibly with a new dslr or dslr-like A900 rumored to be the A99. I am also curious to see how and when a full frame gets downsized to an NEX-7 size. That is the wave of the future regardless of whether it is doable now, it WILL come. I realize the current APS-C lenses cannot cover a full-frame sensor but perhaps deflecting (widening)the light at an angle artificially to do so like a prism without a prism? Just a thought. @Rodrian, if Aptina makes full frame to become mainstream, I am all for it. But I fear, w/o Sony column-parallel ADC technology, the K-5 and alike will beat the Aptina on DR, even if it is full frame. That would be another "crippled" full frame then and such cameras don't fulfil my prediction/hope (as didn't 5D or 700D). What about dimensions and weight of FF body+lens Vs APS-C equivalent? Did you consider these issues? Most people prefer ligther equipment if IQ is good enough. The white paper has a full section on that. Equivalent cameras don't differ significantly on weight or size, esp. if they share the same mount. However, corresponding products don't always exist (yet), and the white paper has a detailed analysis for that too. I would not argue with your technical analysis. However that is rather irrelevant to a determination of why certain products make it to market or succeed once they are there. Most people want cameras that are a) compact, b) hip, c) affordable (but sometimes "spendy", so they look more hip), and d) technically "good enough". For many the iPhone fulfils all these constraints. Given that you passingly acknowledge this real-world fact, I wonder why the emphasis in the bulk of the article on a tiny sliver of the camera market? I disagree with almost all of your other analysis. I don't see the continuing existence and success of APS-C as a mystery at all. For most people they offer better value than FF. Further, I disagree that SLRs in any configuration continue to offer much compared with mirrorless cameras with decent sensors. I don't understand your statement suggesting that lenses have to be compatible with the past for you to consider their systems as contenders (or why this eliminates MFT from contention, since the cameras *are* compatible with such lenses). Moreover, you somehow missed that I only talked about APS-C SLRs, and did explicitely grant a great future for APS-C mirrorless. I find it interesting here how so many are ganging up on your article because I think it offends their SLR identity. Fact is that if we can get an inexpensive FF camera, APS-C is dead because we now have access to what was previously off limits. I have a lot of great lenses from my old film cameras. To have a digital SLR that makes my old lenses I love work without the 1.5x penalty of the aps-c, well that is like saying I still love buying cds to rip to my ipod. Stupid argument. If an inexpensive FF is released I will buy one immediately. I upgraded from my N80 to a D80 and now if a D600 comes out I will certainly do it. I dont have the cash for a D800 and if I did well I have better things to do with my money than look like a JA with an over priced camera I don't know how to use. The whole nit picking this article is just stupid. Camera makers need to stand out. FF going digital and affordable is going to happen. Sorry D3\D4 users, time to yank that silver spoon out. We are moving into your once exclusive hood. Frankly speaking: Most photographers don't even use the full potential of the most basic APS-C cameras simply because they are shooting JPEG, buy lousy lenses, use (cheap) UV-filters, ignore lens shades and prefer image stabilization instead of a tripod. 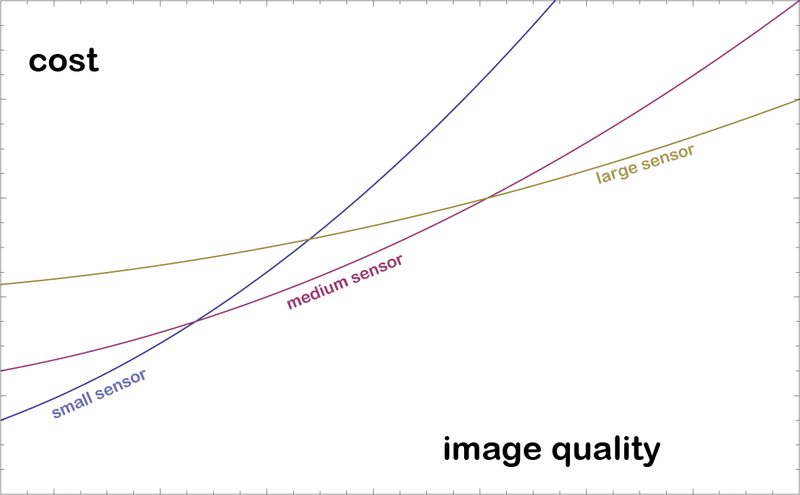 Their images will not improve because of a bigger sensor. And coming back to Pentax: I desperately hope they will stick to APS-C and we will see a K-3 with some mechanical improvements and a slightly higher resolution soon. I hate the idea to buy new lenses once again – and people that plan to use their old Pentax A or even M lenses on a potential “full frame” Pentax DSLR are naive: Those lenses are not good enough for a high res digital camera (like most historical 35mm lenses). On top: I use tele lenses quite often - what's the size & weight of an equivalent to my Pentax DA 4,0/300mm for full frame? Not to mention its price. Your old lenses, are they going to do justice to a modern high pixel density full frame camera? If one has to get new lenses to match these new cheap FF cameras the cost argument is not going to look that great. @Anonymous1 ... "what's the size & weight of an equivalent to my Pentax DA 4,0/300mm for full frame" clearly shows you posted because you have a predefined opinion and didn't care to read the article. This is the last such comment which doesn't get deleted. @Anonymous2: it depends on what you consider "do justice". The white paper discusses that in some detail. In the case of type 1 equivalency (say, a Nikon D4), you get great image quality from decent FF glass even if made for film. In the case of high pixel density full frame cameras like the D800, it is irrelevant because FF or medium format is the only way to get to that kind of image quality anyway ... But even a D800 with cheap FF glass typically outperforms a 16MP APS-C with expensive glass. Very interesting article and I also agree with all of Peter's comments. I use a Canon 60D and my photos are probably not good enough (yet) to get the most out of it's C-sensor (let me keep practicing though!). Marketing distinction & product segmentation is clearly a major reason for the C/FF sensor distinction and I suspect it can't last much longer. If a full frame Canon (or Nikon, or by the sounds of it, I should look at Pentax also) comes out at a lower price than the current ones then I will buy it. The case for FF dslr's is very solid, the production cost are negligeable between APSC and FF, Size is no problem the MZ-S is small and full frame as is the ml52/mz-d/k1 prototype digital, only the fact that :- 1 Phillips FF chip faild in 2001, 2 Pentax was sold to Hoya who owned Tokina and had invested heavly in APSC size lens, Pentax would have gone full frame years ago, Ricoh is not bound by the past and the improvement in the k30 focusing system shows they are going to hit the problems with Pentax hard and fast, I agree with Falk the future is bright (defenently in the case of the view finder - a bonus of FF) the future is FF, and if you have an APSC DSLR get over it. Don't forget that megapixel Nokia phone camera is going to make full-frame cameras look like what they are... over-hyped and over-priced. There better be a big shake-up price-wise and size-wise by the majors pronto! If Nokia throws in IS and low-light later on the die is cast for bulky cameras and maybe even compact ones. "Full frame SLRs become mainstream above $1,000, in a more compact form factor." -Yes I believe so too. "Hybrid viewfinders combine the best of two worlds in high end SLRs." out from your "white-paper") and hybrids doesn't offer any additional value over the traditional EVF. "Mirrorless SLDs and large sensor compact cameras dominate the segment between $500 and $1,000, mobile phones below"
- This year have already been a breakthrough year for enthusiasts-model SLD:s (NEX-7, OM-D and X-PRO-1) and it's only matter of time, when manufactures start to offer consumer-grade models with the same manual-functionalities they can already find from DSLR-cameras. As soon as this happens, it's buy buy DSLR. So yes I believe your stament is correct. -very likely to happen. It's very interesting to see who will be the first manufacturer to offer these. I also think that first global shutter shutter using APS-C camera will emerge in 2-5 years. This will be the final death-strike for DSLR-type cameras. When mirroless cameras with global shutters are used, there is no physical limits for high FPS-cameras and the only limit is processing power. I completely agree with what you have stated here. I am new to Pentax and love to see Pentax doing well. However, just like you and at the back of my mind, if Pentax continues to lose their customers to those FF manufactures, it will face the same fate as a lot of other manufacturers and possibly just have the medical imaging division surviving. Leica was almost history with M8 (cropped sensor) until M9, a FF rangefinder and that changed things around. Basically I think you're right about FF's becoming cheaper and thus will be introduced to markets in coming years. About time if you ask me. What I don't agree is that OVF or Hybrid OVF are still here to stay. You should try out the EVF of a Sony A77. It may not be as crystal clear as a prism OVF, but it's still VERY good, and IMO much more useful (in OVF stats, meters, functions, and last but not least, the actual final image you're going to take, is shown there, for example, if you chose a Black & White Effect. Or you can see beforehand if your image is overexposed or not. And the tech only can improve. Great analysis in both of your articles, and I really hope your predictions become true. FF for the masses! Personally i hope this analysis will happen. Presently using crop sensor. and i feel there are limitations. would prefer full frame for advantages in image quality, iso and shallower depth of field. And wish full frame's body could be smaller in size. a small compact mirrorless full frame camera with prime lens would be great. Fujifilm is almost there. however detered by the slow auto focus, expensive camera and crop sensor concept. Hope this could be a stepping stone for fujifilm to come out with a competitively priced full frame sensor camera in future. A good article. It really highlights the issue of the limitation on the options of what you can do with a crop sensor in practice and the real world. Keep up the good work. And thanks for sharing. With FF going into mainstream, do you foreseen DSLR manufacturer put a bigger sensor than FF to fill the higher end segment in the DSLR market after 2014? My personal expectation is that there won't be a new medium format SLR mount, except maybe from China (it would be the cheapest way for a Chinese company to enter the premium camera market). So, Pentax and Leica, yes, but no MF SLRs from Canikon. It is much more tempting to do a mirrorless MF, with the predicted French 33x44mm CMOS sensor (to be used by 645DmkII and S2mkII) being an enabler. I wouldn't rule out for Canikon to release 33x44mm mirrorless to keep still camera offers in the $5000+ segment. But not as long as full frame is sufficient to fuel growth. Good summary of the issues. I bought the D800 mainly because its pixel density was roughly the same as my D7000. For years I have I wanted DX pixel density and as many of these pixels as I could get. Now I no longer participate in the FX versus DX debate My D800 is 'FX' - and 'DX' when I want it to be. The advantage: I pick where I crop a DX sized image from my 'FX canvas'. I'm not a pixel-peper. I just crop almost every picture I take. "Cropping range" is more important to me than "low-light range". Since FX pixel is well proven, I knew providing the same density in FX would be a good upgrade. Now I wait for an Inexpensive mirrorless FX body with 1/4 the parts and complexity of my D800. I think there is a 50-50 chance that this body will come from a vendor other than Nikon. The lower cost of production means that someone can beat Canon and Nikon at their own game. I like this comment as I too am a "cropper". Did you have a D7000? I am getting a demo D800 today for a couple days and I'm very curious to see how it compares performance wise to the D7000. I do not own a D7K but I have rented and loaned it for long enough to know that it's a decent performing camera. How do you find the performance of the D800? From an emotional stand point, is it fun, do you feel like you could shoot in any condition without compromise? Why would you say that the sub-$500 market wil be dominated by cell phones?? Consider a small-sensor camera with 12x zoom. People still want zoom lenses, and a cell phone will never have a 12x optical zoom due to size considerations. On the other hand, APS-C let alone FF with that kind of lens is pretty large for many consumers to lug around. So I don't see why this segment should disappear. Falk I agree with your logic as stated in your overview. The time has come for full frame to make a dominant mark in the industry. I've seen a large number of people move into the full frame market by purchasing the D800 and I can only imagine the huge shift that will take place once the D600 is available. A combination of a full frame body and a high quality APSC body completes a photographers kit quite nicely. As a Pentax K5 user, I am hoping for an announcement from Pentax regarding the production of a full frame body in the near future and have been modifying my lens collection accordingly. I anticipate that along with an announcement will be the announcement of a full frame lens lineup with a number of planned new lens released to work with the new body. let´s say you can put 100 APS-C sensors on a wafer but only 25 FF sensors. yes i made up the number.. to late here and my calulator is broken. :) but i guess you get the picture. so a APS-C sensor will always be much cheaper then a FF sensor. saying aps-c and FF cost the same in manufacturing is wrong. YOU may not have done the math and YOUR calculator may be broken. So, I did all the work for you and have a proper background too. Read the paper. Btw, it doesn't say that aps-c and FF cost are the same, nor do the cost curves. Please, refrain from commenting if you don't have the time to understand what you're reading. THNXS. Hello Falk. Great article. Mind opener and terrifically entertained. Although some of your predictions are more likely to happen and some definitely will, your article has some of the science fiction novel or Hollywood movie syndrome in which the time for predictions to become true are always off. In short your times are too immediate. I think you should give them some more air. For practical reasons (for me) I would like to give them 2 more Kinas to happen or 4 more years. Now, that there seems to be a general acceptance to your article and predictions, I'd love for you to write and article similar to this one but between FF sensors and MF sensors. As a professional and long time user of film medium format cameras, I would be delighted if you share your wit about the issue. If FF becomes rule of the day, it looks to me that maybe now, the waters are going back to their right sea level. So, it was a 15 year long tsunami!. Will this mean that medium format will regain its natural position among pros and serious enthusiasts and survive the digital era? Will this happen because prices will come down to "sane" levels or just because photographers will do the final herculean effort to stand out from the crowd? But even me do concede that it is too early to predict the future of medium format. The first thing I'd like to see happen is medium format go CMOS. Btw, I didn't say that FF will become rule of the day. I said that it will do so in the premium image quality niche. And you're right, that niche may or may not evolve to eventually be dominated by medium format. But if medium format, it may be mirrorless to bring down the size closer to the mainstream. Who said the difference is superficial? Btw, the availability of equivalent glass for APS-C vs. FF is well covered in the article. I found a new site worth to visit frequently! If everyone takes a step back and thinks about what the average camera consumer understand on the size of sensors (APS-C, FF???? - who cares!) then it is logical to assume that the argument here on the future of DSLRs is confined to an ever shrinking (proportional to the overal market) group of enthusiasts who pixel peek. APS-C to shrink in range with focus on high-end enthusiasts (e.g. D7000/60D) with the 1xxxD/6xxD/D3xxx/D5xxx ranges wiped away by the ever growing micro 4/3rds sector. (Remember that sensor labels are meaningless to most consumers) and they care about size/style/ease of use. The big camera game changer could be a new non camera company (e.g. Apple) who wil DESIGN a camera with focus on ease of use and stylish looks with no mention of sensor labels. This will be a premium product and likely to add additional pressure on the 6xxD/D5xxx sector as there are plenty of users in that range who know nothing about their camera and don't want to know. Thats my take on things! After nearly 3 yrs of using Pentax DSLR (K200, K5), I think I am ready - learned enough shooting w/ DSLR + confirming my love of photograph ;) - that I would like to 'upgrade' to a FF camera. Good analysis Falk. I have to say I agree with your predictions and I have already been planning my lens investments along the same lines. Once a DSLR that is around the mainstream price of an enthusiast APS-C sensor is released, the whole target category will start to shift towards FF. The main thing that will probably slow the growth of adoption will be inertia from existing lenses designed for APS-C. I think size may eventually become the main competition point for mirrorless cameras, with two main product competitions being APS-C/m43 system cameras versus >1" all-in-one compacts. Ha ha ha ha. The "hypothetical D800C" is a Pentax K-5 with a Nikon label. Nice one, Falk, and I entirely agree. Why not just buy a Pentax and be done with it? The sensor is right up there, yes, not quite at D800 level but equal to full frame in most respects. Wait for Photokina. I think Pentax will satisfy us once again. While i fully agree that FF are superior to APS-C in many conditions, the camera fitted with ASP-C generally provide faster frame rate (granted that it may change in the future, but I think that APS-C will always be a bit better here), also one has to consider FoV problem: long focal lens cost a fortune, and that alone is a solid argument for an high-end APS-C business. Fransisco, you express a common point of view and while there is quite some truth in it, the article basically tried to invite readers to reconsider some of their convictions. APS-C doesn't have the better frame rate but fewer megapixels has. Some full frame dSLRs feature 14fps. And there shouldn't be big problems for FF to go to 50MP. IMHO, a 50MP full frame camera wouldn't be the result of megapixel race but a reasonable thing to do. Its 4.15 µm pixels would still be large. I agree with you some FF go up to 14fps, but the camera is very bulky and still very expensive and of course the price for such performance is expected to get more "friendly" in the future. I was just referring to the current speed status where APS-C wins unless you go for flagship camera, that is what i meant by "being a bit better", sorry for the misleading sentence. For me the difference in the FoV and the extra reach will be what will save the APS-C from dying in the way you described (at least for a while). Sport and bird enthusiast need long focal length and speed. So as i see it, you will have the APS-C around as long as the FF sensor cannot compete with the pixel density.The day the pixel density will be on par will be the end of APS-C. As for the speed i do not see it as the limiting factor here. The difference in FoV and extra reach was discussed in the paper, with no clear winner. You don't like canon? do you? ;) I've less experience with Canon, that's all. The only relevant point for me to get a full frame camera is the possiblity to get _cheap_ real ultra wide lenses. Hey Falk, I always appreciate your posts and the rigor that you apply in your blog and on PentaxForums.com. But, theory aside, the reality is that the D800 and 5Diii are more expensive than their predecessors. Thus there is no evidence that FF cameras are getting cheaper. The D800c/D600 is a unicorn, for now. I don't expect Nikon or Canon to make waves in the market anymore. They are 800# gorillas, protecting their cash cows (APS-C and FF dSLRs) with incremental improvement of their core products but otherwise conservative product strategies (see, Nikon 1, Canon EOS-M). The innovators are the smaller brands with nothing to lose and market share to gain, the Sony's (RX100), Panasonic's (GH2), Fuji's (X-Pro 1) and Olympus' (OM-D) of the world. I hope that Pentax join these ranks. They've certainly experimented with the Q and the K-01. Could a FF/MF mirrorless be next? That's my unicorn. Fascinating research and conclusions. Interesting, mostly, comments. I would just like to say, as an aging photographer, "the consumer wants what the consumer wants". I want a Leica S, and everything that it offers. If I were a rich man, that's exactly what I would get. What the consumer gets is what they are comfortable paying for. So, back to your basic premise. I would say that if Sony/Nikon/Canon and any others intend to continue selling to consumers they really need to understand them better, and meet their wants at reasonable prices. We have chosen u43 or APSc for many reasons. My personal reason is the size and weight of the kit and lenses. I have a bad neck and shoulders, and the thought of a D4 with lenses wrapped around my neck causes pain. If you offer me a FF in a size and weight that I am comfortable with, I will buy it. Who would "choose" the inferior product? My friends in Malaysia or Germany may have different wants, and different abilities to achieve those wants. There are cultural and market forces at work that are different in many parts of the world. The camera makers should understand this. Those forces however, do not stop Apple or Samsung from making wildly and widely popular consumer goods. I wanted an Apple for decades, but only recently converted. Now that I have, I would never go back, so it would be if Nikon or whomever puts together a reasonably priced package of FF cameras. Here's a prediction. The first maker to offer a 100% line of FF Rangefinder like and SLR like cameras, 100%, will sell more units than they can ever imagine. You see, I want the D4 sensor, the D800 sensor, but I don't want a D4 camera. The D600 is closer and perhaps the D400 closer yet. I will drop my D90 on a student who cannot afford anything else tonight, if something smaller and lighter than the D90 contained the 24 MP sensor of the D600. I believe that you're pretty much right, Falk. The FF/APS-C separation should fade, or break down, hopefully sometime soon. But I think the drive from the market (the call of the users for a cheap FF) is not yet strong enough and manufacturers of course like to keep FF in the premium segment with premium profit margins. I'm an older prosumer who just wants to get back to using the 'traditional' format (FF) that I had back in film days. Simple as that. And, since I have been introduced to Pentax (my K-5 is awesome! ), I really want my FF to be Pentax. So, I am going to be patient a bit longer (maybe thru Sept 2013) and hope hope hope there is good news from Pentax by then! Thanks for this article, it really rings true with me. I read this article found surfing on Google. Very interesting and well writted. But I'm not very agree with it. I think, simply, that in the next future those who buy a reflex system will be people that needs of specific features: fast AF, continuous AF, fast speed operational, fast fps and after all that: sensor. At the end of the article i understand that you would almost degrade the APS format for non-professional machines ... in my opinion the article falling in the error to consider a professional reflex apparatus according to the sensor. In my opinion today buying a dslr should be evaluated for other factors expressed before (if you focus only on the sensor in the choosing a dslr, you can get simply a mirrorless). I think that in the next future we will find ff and aps sensor also on all mirrorless on the market, at that point we do? Degrade the ff dslr because their sensor is mounted on smaller devices? So i think that a dslr system remains professional for other factors, independently (or secondarily) from the sensor. Interesting to read this article today six months after it being posted. Both Canon and Nikon have now released "inexpensive" FF cameras (6D and D600). I guess it won't take long until the D600 hit the $1000-1200 mark if dropping in price at the same pace as say the Canon 600D. Of course, many of us have quite a lot invested in APS-C lenses and so will keep on using APS-C cameras for many years to come. Håkan, you're right. Actually, Nikon ran a promotion for the Xmax season 2012 in the US which made the D600 (as part of a bundle including the 599$ 24-85/3.5-4.5G lens and a few goodies) $1250 only. So, it has happened already. However, the offer isn't valid anymore. - At last Pentax is coming with FF later this year. - You don't mention shutter speed (and motion blur), but i understand it must be the same when comparing cameras. Yes, shutter-induced blur is the same assuming shutter-to-body weight ratio is the same and same construction too.